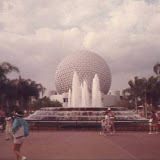 My first trip to EPCOT Center was in 1986. The Imagination Pavilion was AMAZING! The ride was captivating, and I remember wanting to ride it over and over again! It was an experience, and then when you went upstairs you really got to explore and connect with the subject at hand…Imagination. Fast forward to today, and you have a tired ride that has no staying power. Besides the cuteness of Figment, which no one can deny, I find that my take away is bleak. Rather than exploring what Imagination is and can be we get shown how much imagination is fought, misunderstood, and held captive at times. Kodak’s exit after 28 years of sponsorship is bittersweet, but with their departure I find hope that one day we’ll be “Makin Memories” and find the “One Little Spark” we have all been hoping for!